On Wednesday (22/03/2017), SNP MSP Joan McAlpine used her column in the Daily Record to attempt to cast doubt on her own Scottish Government’s GERS figures, the official numbers that tell us how Scotland’s economy performs. When oil was booming, McAlpine and her SNP colleagues were quick to quote GERS figures as proof that Scotland was a wealthy country, so this U-turn might seem surprising. If McAlpine’s column represents an approved party line, it looks an awful lot as if the SNP are trying to avoid an honest debate about the economic challenges an independent Scotland would now face. It would be like the big tobacco companies who, when faced with solid evidence of the link between smoking and cancer, focused on questioning the science and placing doubt in peoples’ minds. When facts are your enemy, confusion and doubt are your friends. To be fair, we’ve yet to see the leadership of the SNP suggest that we can’t trust our own government’s figures - but we’ve also yet to see them shut-down those within their own party who, like Joan, seem to be becoming GERS-deniers. Maybe the SNP hierarchy think a bit of doubt and confusion is helpful? So let’s look at McAlpine’s claims more closely. She incorrectly refers to GERS as “the UK Treasury’s understanding” of Scotland’s economy; she really should know that in fact they represent the Scottish Government’s understanding. So how can she suggest her own Government’s figures are “absurd”? She relies entirely on the wild-eyed claims of one Professor Richard Murphy. He’s a chartered accountant and the self-proclaimed architect of “Corbynomics” - but let’s not worry about his CV, let’s worry about whether what he said is true. Those hoping to foster confusion and doubt would be delighted for people like me to fill column inches explaining why Murphy is wrong. That way they stop us talking about what the figures actually tell us. McAlpine’s advice to people being presented with inconvenient truths was hardly subtle: “throw three words at them: Professor Richard Murphy”. Who needs to deal with facts when you’ve been taught the name of a tame professor who gives you permission to ignore them? For what its worth, Murphy clearly doesn’t understand the GERS figures. He doesn’t realise that the Scottish Government compile our export data, so it isn’t “the UK Government making this up”. He fails to grasp that it’s the Scottish Government’s Chief Economist who decides on the assumptions behind the GERS figures, so nothing is “what the UK Government decides it should be”. I explain more of his mistakes here, but his biggest error is to claim that the figures can’t be trusted simply because estimates are used. I asked a couple of exceptionally well qualified economics professors to comment on Murphy’s claims and you can see what they had to say below. Put simply: nearly all economic statistics are estimates, but to be qualified as National Statistics (as GERS are) the figures have to be shown to be trustworthy. End of discussion. “As in practically any statistical exercise the GERS statistics depend on estimates, there is nothing unusual about that […] that is why mainstream economists, statisticians and commentators will continue to use these statistics." So let’s focus instead on why some Yes supporters now want to deny the economic reality described in GERS - what are they so desperate to distract you from? Firstly they tell us how much tax revenue the Scottish economy generates from our current economic activity and the taxes we’re all used to paying: income tax, VAT, council tax and the like. Secondly they tell us how much money is spent to deliver the public services we’re all used to receiving. So that’s things like health, education, pensions, social welfare, policing and so on. Thirdly they show how much it costs us if we pay our population share of expenses incurred for the benefit of the UK as a whole - mainly defence, debt interest and international affairs. Finally they show what happens if you take that revenue and subtract those costs. In the most recent year that shows we’d be in the red by £15bn – that’s the infamous £15bn “Scottish deficit”. Of course that wouldn’t actually be Scotland’s deficit if we were independent, but all credible economists and responsible politicians (and even the SNP) use the GERS figures as the starting point to work out what an independent Scotland’s figures might look like. So, for example, we could assume we’d spend £0.6bn less than we’re currently allocated of UK-wide costs (like defence) and we could assume we’ll generate £7.9bn a year of oil revenue. That’s what the SNP’s Independence White Paper did last time round. They based our ability to maintain public spending on a reckless gamble about oil revenues. In fact, oil revenues this year will be approximately zero. If you understand GERS the implication is clear: to survive as an independent country, Scotland would have to make dramatic spending cuts, cuts far more painful than any “Westminster austerity” we’ve seen to date. Are the SNP prepared to be honest about the price we’d all pay for independence? If they allow high profile MSPs like Joan McAlpine to publicly rubbish their own figures, it’s surely not a good sign. In the interest of honest and informed debate, let’s hope the SNP leadership condemn those who pretend we don’t know basic facts about our economy and instead face the difficult truths those facts reveal. There's a lot of nonsense being talked about the SNP's mandate to request a second independence referendum, so I thought I'd try and very quickly clear it up. "what I'm talking about is the Scottish Parliament having the right to propose a second referendum if it becomes clear that a majority of people in Scotland want independence, it would have to be a majority of people that want it"
Is it so naive of me to expect that Nicola Sturgeon might actually stand by her words? 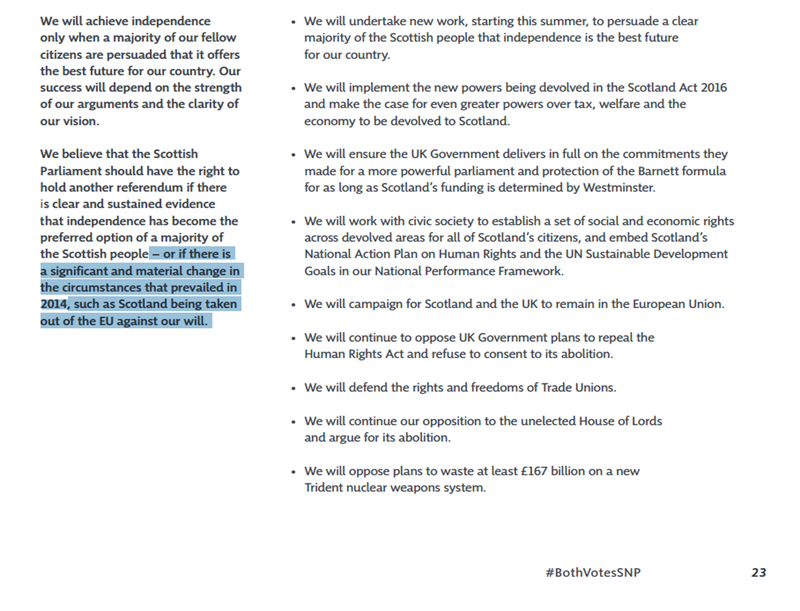 The response from the SNP would of course be that what technically matters is the Manifesto that the SNP stood on. "We believe that the Scottish Parliament should have the right to hold another referendum if it is clear that more than half of the people in Scotland want independence." At this point I would suggest that - given their rhetoric and their "easy read" manifesto - the SNP morally only have a mandate to propose a second referendum if it is clear that a majority of people in Scotland want independence. "We believe that the Scottish Parliament should have the right to hold another referendum if there is clear and sustained evidence that independence has become the preferred option of a majority of the Scottish people – or if there is a significant and material change in the circumstances that prevailed in 2014, such as Scotland being taken out of the EU against our will." Given we're into fine detail here, it seems fair to be picky about these words. Stating that you believe something should be the case is not making a manifesto commitment to do it or indeed asking for a mandate to call for it - it's simply a statement of belief. Semantics aside, this is akin to Amazon pointing out that they can do pretty much whatever they like with your personal data because you ticked their Terms & Conditions box1. 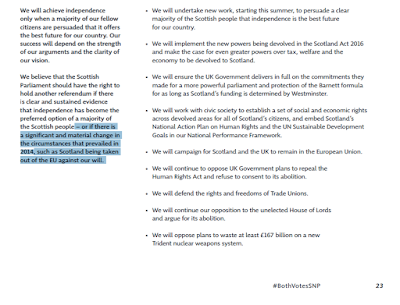 The SNP may be able to argue that technically their manifesto gives them a mandate to ask for indyref2, but - given their pre-election rhetoric and summary messaging - morally they're on distinctly dodgy ground. 1. I wonder how many people who shop with Amazon realise they've accepted "Terms & Conditions" that state Amazon "reserve the right to make changes to any Amazon Services, policies, terms and conditions including these Conditions of Use, and Service Terms at any time."? Twitter has been been rife with “GERS denial” over the last 24 hours, triggered by a bizarrely ill-informed blog written by "the man behind Corbynomics", Richard Murphy. It's clear if you read his blog that he hadn't read the GERS methodology statement before he wrote it and - being brutally honest - he appears not to understand the basic principles of economic and statistical analysis. But as this blog will show: you don't have to take my word for that. "They may 'compile' them but there is no data underpinning them"
"there is no data. It's almost all just estimates. GERS says so. I didn't have to make that up"
"it's nonsense data derived from UK stats, as GERS say." "But there is no data: just estimates"
What is extraordinary here is that Richard appears not to understand that almost all economic analysis relies on estimates and that the estimates in question here are very much based on actual data. Suggesting the term "estimate" is somehow synonymous with "no data" shows that - frankly - he's either an idiot or that he assumes the people following him are. Nearly all analysis of national statistics relies on estimates. That's why there are codes of practice that civil servants have to follow, why we have independent bodies to assess and qualify reports and why statistical calculations are used to determine what confidence intervals are appropriate to any findings. We're now getting into conspiracy theory territory. But who am I to question the opinions of the Professor of Practice in International Political Economy at City University? I am, after all, just a businessman and blogger - albeit a reasonably well informed one who has a hard-earned reputation for knowing what I'm talking about on this subject. So predicting the usual ad hom responses1, I decided to ask for help from a couple of the experts I'm fortunate enough to know. I asked Professor Ronald MacDonald for his thoughts on the subject. Professor MacDonald is Research Professor in Macroeconomics and International Finance at the Adam Smith Business School; he has acted as an advisor on currency and exchange rate issues to the European Commission, IMF, World Bank, European Central Bank and a number of other central banks. He was previously Bonar Macfie Chair of Economics and Adam Smith Chair of Political Economy at the University of Glasgow and Professor of International Finance at the University of Strathclyde. I think we can fairly say that Professor MacDonald knows his stuff . "It is important to note that that GERS is a national Statistics publication and assessed by the independent UK Statistics Authority. The statistics are produced by civil servants, and not by a partisan group, and are best practice in the sense that they meet the Code of Practice for Official Statistics, a code that is consistent with the European Statistics Code of Practice. As in practically any statistical exercise the GERS statistics depend on estimates and there is nothing unusual about that. In that regard it is noteworthy that the statistics produced and reported in GERS come with standard confidence intervals indicating the uncertainty with which the central estimates are held. An examination of these confidence bounds demonstrates that the generally accepted position on Scotland’s fiscal and trade positions are unchanged. This is why mainstream economists, statisticians and commentators will continue to use these statistics in their work." That really should be an end of it, the very foundation of Richard Murphy's "they're just estimates" case is shown to hopelessly naive and fundamentally flawed. If you're struggling with how come estimates are acceptable: your watch estimates the time, your speedometer estimates your car's speed, your scales estimate your weight. You still know with reasonable confidence the time, how fast you're driving or how much you weigh. In case you still need convincing, I also asked Professor Angus Armstrong for his response. Angus is Director of Macroeconomics at the National Institute of Economic and Social Research (NIESR) and was previously Head of Macroeconomic Analysis at HM Treasury. It would be fair to say he too knows this subject better than most. I shouldn't really need to go on, should I? "So forget Scottish GDP data: we just don’t know what it is." This will come as a shock to those who believed the SNP during the independence referendum when (because of oil) they were able to say (of the then recent past): “Scotland is the 14th richest nation in the world” and "Scotland’s GDP per head is £2,300 higher than the UK as a whole”. According to Richard we can't possibly know that. "The allocation of government spending to Scotland will be arbitrary: how much defence should it pay, for example? Or interest? The arbitrary areas will be too great for this number to really be reliable." Notice how he says "will be" twice in this paragraph? That's a clue to the fact that he hadn't actually bothered to check; he was asserting what he assumed "will be" the case. Anybody who has taken even a passing interest in the debate will know that what is the case is GERS apportions the two specific examples he quotes on a per capita basis. "International Affairs" is the other category allocated this way - if he'd read GERS he'd have probably thought to include that example too. It's widely understood that while we're part of the UK we pay our population share of expenses like these that are "incurred on behalf of the UK as a whole". More importantly: when making the case for an independent Scotland these three figures are normally the first to be looked at precisely because we can see them clearly identified in GERS - that's why everybody (including the SNP with their White Paper and as we'll soon see with their Growth Commission) start with the GERS figures and then make assumptions about what would replace them if we were independent. Richard says of all these figures "to base debate on them would be a serious mistake". That would only be true if you were to make the serious mistake of not understanding how the figures are compiled and what they tell us. In fact the data provides a perfect platform on which to base a debate about an independent Scotland's finances - that's why everybody from the SNP through to the IFS do precisely that. "Let’s be blunt: no one has a clue what crosses the borders from Scotland to England and Northern Ireland. These numbers are literally made up in that case." So here we're moving away from GERS to something else Richard clearly hasn't looked at: Export Statistics Scotland (ESS). This is data compiled by the Scottish Government, primarily using the Global Connections Survey run by the Scottish Government. Yes it's an estimate - but one triangulated with other sources and which qualifies for designation as National Statistics (which as we hopefully now understand, really means something). I suppose at some level all numbers are "made up", but to suggest the extensive work carried out by the Scottish Government in this area amounts to "no one has a clue" is as witless as it is insulting to those involved. "Westminster could pretty much manipulate this data at will." An astonishing statement, and one that could only be made by somebody who has never communicated with those responsible for this report, namely the Scottish Government's Chief Statistician and Chief Economic Advisor. The idea that Westminster could have been consistently pulling the wool over the eyes of the Scottish Government when it comes to our national finances is not only ridiculous, it's deeply insulting to the professional integrity of the honest, hard-working civil servants involved. If you are one of those who believes that there is some Westminster conspiracy which has been so brilliantly performed that the Scottish Government haven't noticed, I've honestly no interest in debating with you - feel free to not read this blog, I won't miss you. "if there is to be meaningful debate on this issue then the SNP have a lot of work to do to produce best possible data. The last thing they should do is trust that from London"
Well it's easy to see that Richard is new to this debate. What on earth does he think the SNP were doing during the years they prepared for the independence referendum while they were in government? I imagine there are more than a few exhausted civil servants who will be thrilled to hear that someone who demonstrably hasn't read any of their rigorous, detailed and professional work thinks they have "a lot of work to do". In fact I'm sure a few SNP politicians will find it amusing that Richard thinks they blindly "trust that from London"
I could go on, I really could but - like me - life is too short. So to recognise the fact that there are of course estimates used in compiling these figures, instead of saying "Scotland's GERS deficit is £14.9bn" we could say "we can be 95% sure that Scotland's GERS deficit is in the range of £14.3 - 15.5bn"2. It would be tedious if we said that every time though, I'm sure you'll agree. To finish with another example of how confidence intervals work: when Richard Murphy repeatedly claims "there is no data", we can say be 100% sure that he doesn't have a clue what he's talking about. 1. apparently the fact that my little £20m turnover online business (employing people in Scotland, of course) sells - among other things - dog food means I can't have any credibility in this debate. Who knew? 2. as many of us have pointed out, there is one other significant allocation uncertainty on the revenue side which is not survey based but assumption based and that's corporation tax. After a few years of disagreement, on this figure HMRC and GERS make very similar assumptions, basically assigning £2.9bn or 7.3% of corporation taxes to Scotland. As a sanity check, Scotland account for 8.3% of the UK's population. The simple truth is that given companies are not currently required to report profit split between Scotland and the rest of the UK, nobody knows what these figures would be were Scotland to be independent - changes to tax rates and corporates' decisions around where to base activities and how to report profits make this figure a moving feast anyway.